Eventbrite RSVP required for your FREE CANNA TREAT BAG upon entry. Admission can also be paid at the door, but why miss out on some adult trick-or-treating?! 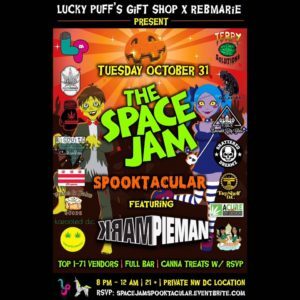 As always, FREE DAB BAR provided by Lucky Puff’s Gift Shop, DC’s top I-71 cannabis vendors, full bar, outdoor patio area, and BEATS by Mark Pieman. RSVP on Eventbrite or DM SPACE JAM DC for exact location. Let’s get weird.